As a young, injured red-footed Booby sat in its kennel on a plane headed from Kauai to the Big Island, it had no idea that it was about to become the first patient at the Hawaii Wildlife Center, a brand-new, state-of-the-art, native wildlife rescue and rehabilitation facility, or that it’s journey to recovery would become a telling story of compassion, dedication and statewide collaboration for the benefit of native animals. Like many nonprofits, the HWC started as a vision to fill a critical need. That dream and desire to protect Hawaii’s native wildlife soon turned into a professional wildlife care, rehabilitation, research and education center that specializes in native birds and bats, the only one of its kind in the state. The mission of HWC is to protect, conserve and aid in the recovery of Hawaii’s native wildlife through hands-on treatment, research, training, science education and cultural programs. The 4,500-square-foot facility in Kapaau on the north end of the Big Island has been purpose-built for the best achievable wildlife care and rehabilitation and to incorporate public involvement and engagement in conservation issues. HWC rehabilitation staff are highly experienced in wildlife treatment, rehabilitation and emergency response, and are extremely passionate about the work they do. The HWC received its permits this September and have since hit the ground running. The road to recovery can often be a lengthy, involved process. 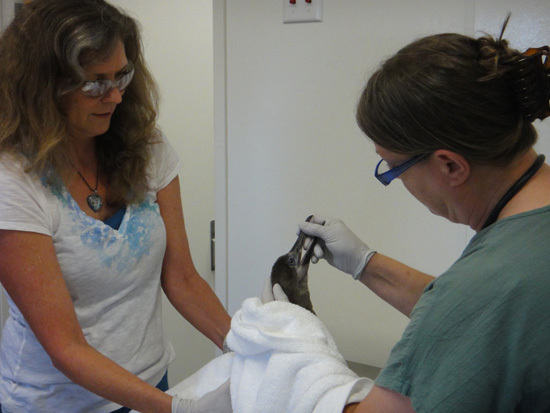 The young Booby was immediately given a thorough examination upon its arrival to the HWC facility. 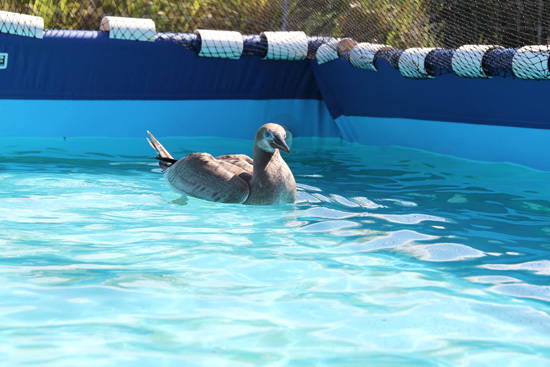 When it was determined to be strong enough a week later, it was introduced to the seabird flight aviary, a custom-designed flight pen that would allow the young bird to strengthen its muscles over time and practice flying. Similar to physical therapy for humans, the availability of sufficient space for flight practice is critical to ensure a successful recovery and to maximize the animal’s chance of survival after it is released. Equally critical to a bird’s success after release is the waterproofing process, the removal any oils or residue from feathers that would prevent birds from becoming waterproof. 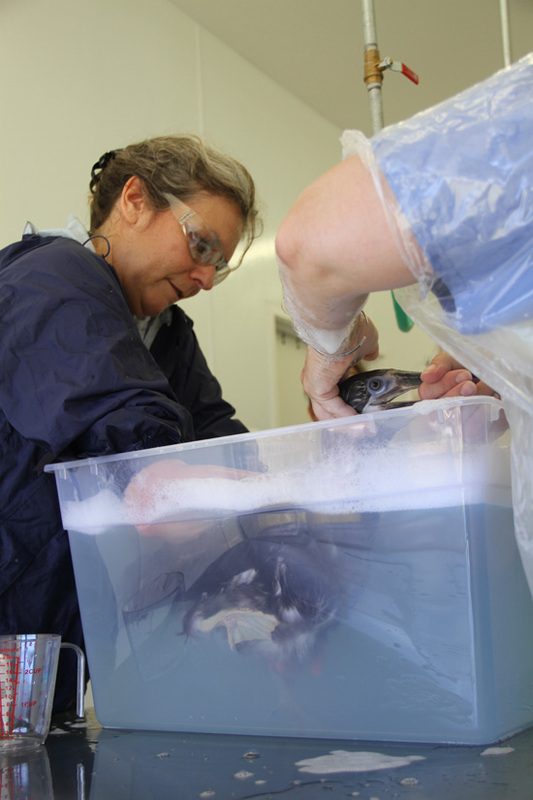 HWC founder, president and director Linda Elliott is a seasoned veteran of waterproofing and bathing procedure having managed wildlife response at 18 oil spills all over the world, including an incident involving 20,000 oiled penguins. Using nationally recognized wash and rinse procedures, HWC gave the young Booby a bath and allowed it to dry in a specialized drying pen. Once dry, it was allowed into an outdoor conditioning pool where HWC staff could monitor it to ensure it was completely waterproof. 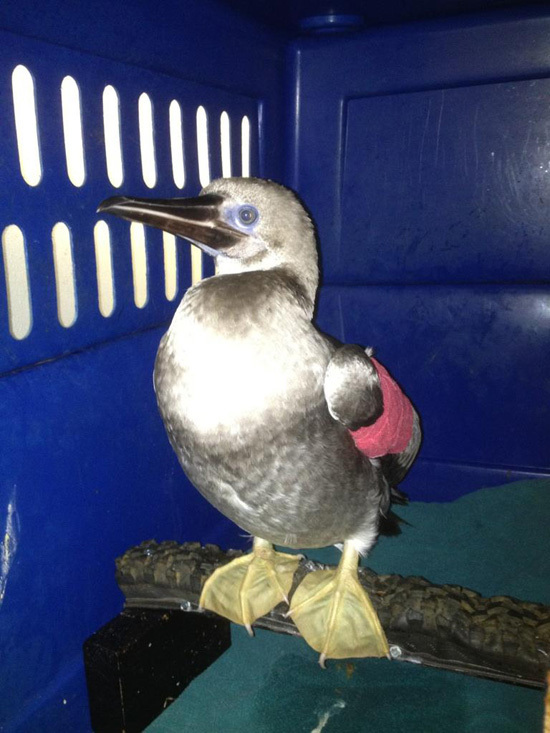 Once the young Booby was given a clean bill of health and was found to be completely waterproof and in full flying condition, it was ready to be released. 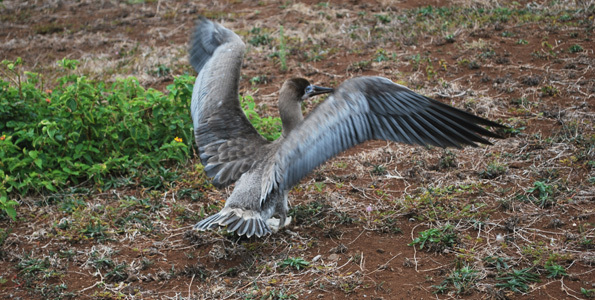 Since this was a young bird, so young that it had not even developed the signature red feet of its species, it needed to be released back to its colony on Kauai. Getting the bird to the HWC facility was a great collaborative effort between DOFAW Kauai, Hawaii and Honolulu district offices, Kauai Humane Society Save our Shearwaters Program, Hawaiian Airlines, Department of Agriculture and HWC staff. Everyone was working just as hard to bring Booby home, and a volunteer pilot eventually came forward to make the trip. From local collaborations with wildlife agencies and other passionate wildlife rehabilitators to national collaborations with Focus Wildlife and Cornell University’s College of Veterinary Medicine, the HWC has strived to work with other experienced and passionate groups and individuals to continue enhancing the quality of available wildlife response, care and rehabilitation available to Hawaii’s native species. This young Red-footed Booby is the first of many that will be given a second chance at survival through the dedication and commitment of HWC staff, wildlife agencies, HWC collaborators, and volunteers. And what about the Booby? After being given a warm welcome at the Lihue Airport, it was transported to its release site where it stretched its wings and got its bearings before taking off towards the coastline. As a 501(c)(3) nonprofit organization, the critical work that the HWC does with native wildlife all depends on community support. To play a role in future rescue efforts by donating, volunteering or becoming a part of the air and ground wildlife transport team, call (808) 884-5000 or send the HWC an email at info@hawaiiwildlifecenter.org. The HWC is Hawaii’s only state-of-the-art rescue, rehabilitation, research and education facility exclusively for native wildlife. We take a very hands-on and comprehensive approach to conservation and species recovery and currently have the only facility in the state that meets all federal, state and local standards for accommodating a large-scale rescue and rehabilitation effort targeting sick, injured or oiled wildlife. It serves all Hawaiian Islands, including the Northwestern Islands extending to Midway and Kure Atolls. It is fully permitted for the rehabilitation of all native bird species and the Hawaiian Hoary Bat. The HWC is not a zoo or a preserve, it is a professional organization that focuses on treating and rehabilitating sick and injured native wildlife for release back into the wild. The HWC only accepts native seabirds, shorebirds, birds of prey, waterbirds, forest birds and the Hawaiian Hoary Bat. The HWC does not accept introduced, non-native, invasive, exotic or agricultural animals.